More than just cars, the William E. Swigart, Jr. Automobile Museum displays vintage clothing and accessories that recall the days when proper decorum kept ladies covered from head to toe. 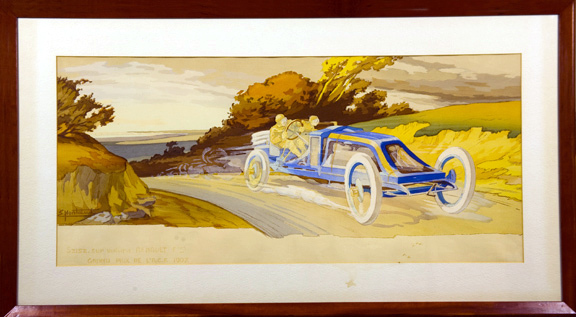 The excitement of early automobile racing and old cars is depicted in prints, paintings, and photographs from renowned automobile artists such as Ernest Montaut and Peter Helck. And post cards sent from across the country as Americans traveled in ever increasing numbers are just some of the treasures awaiting visitors. Can you picture an automobile salesman coming to your home or office today without the car and carrying a kit such as this? It was really quite effective and the Renault factory of France extensively used them just prior to and following into the 20th century. Any number of combinations of hood and body options could be set on the running gear and chassis. Folks who were reluctant to give up their fine carriage would almost duplicate its appearance in the new horseless carriage. Authorities state that this is the only remaining kit in existence. It was brought to this country by one of the factories. Its rarity makes it a most unique item, and it can be seen at The Swigart Museum. 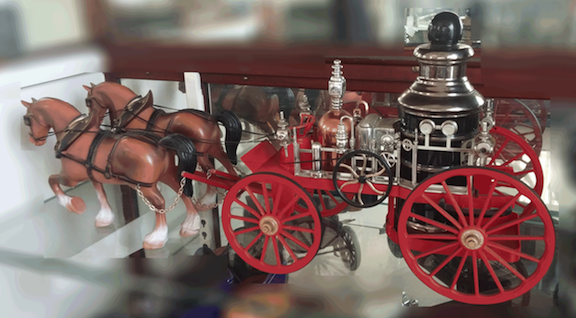 Pictured to the right is a Jim Beam 1867 Mississippi Pumper Fire Engine Decanter, another rarity to find this item with the Clydesdale horse. This decanter is modeled after the 1867 Mississippi Fire Engine no. 313, a steam powered pumper for fighting fires from a distance and mounted on a wagon. This decanter boasts minute details such as headlamps, hubcaps, and several pipes connected to the steam chamber and water tank. When you visit the Swigart Museum you will find a large collection of Jim Beam collector decanters on display on one of our beautiful antique display cases. The Jim Beam decanter collection is another example of cars and more, and more, and more. 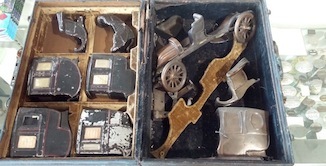 We have many unique antique items on display at all times.